← Can Donors Make Recurring Donations? Mercy Learning Center’s motto says it well: Educate a Woman . . . Educate a Family. The center is all about teaching women the literacy and life skills that empower them to be independent, confident and self-sufficient. The center operates on the belief that an educated woman not only has a chance to reach her full potential in life, but also become a person who makes a lasting difference for her children and family—leading a fulfilling life. Every low-income woman who enters the center is helped in a holistic way in a caring, supportive environment. The staff comes up with an individual educational plan for her, knowing she may need help in other areas of life in order to learn. Intensive Study Program – Classroom-based, full-time, 9-month instruction – 20 hours a week plus 5 hours of weekly computer instruction. Five course levels with curricula based in real life scenarios cover math, reading, civic/social studies, science, writing, computer technology and family literacy. Tutoring Program – Part time instruction in English as a second language, adult basic education and General Educational Development (GED) prep, one on one or in small groups for at least 4 hours a week throughout the school year. The center’s Support Services provide the additional assistance women need, including on site care for infants, toddlers and preschool children while their mothers are in class; a food pantry; mental health counseling; health consults, citizenship training, career and college counseling; driver’s license assistance; and technology training. There’s even a full time case worker on staff. “It’s tough to navigate society when you don’t speak the language. It can be completely overwhelming,” explains Cassidy. “To be responsive to issues that crop up, in the last year, we’ve also added workshops for tenant’s rights and responsibilities [we found landlords were not respecting our students’ rights as renters] and school bullying.” In 2014-2015, MLC offered classes, workshops and fairs on 21 life skills topics. Mercy Learning Center has used JustGive’s nonprofit donation services for the past two years. The center added a JustGive link to its own donation button on the website, and has customized its Donation Page with a photo, description of purpose, and a list of what specific size gift can do—with seven giving levels ranging from $100 to $10,000. The giving levels reflect the center’s different donor categories and answer the question Cassidy often hears. “People often ask for a concrete answer for what they can support,” she states. When asked about her experience with JustGive, Cassidy comments, “JustGive is one of the most affordable, and we also appreciate the option for the donor to add in the processing fee so we get the full donation amount.” She adds that JustGive’s online capability makes it easy to integrate the center’s appeal into other communication channels too. In 1987, Mercy Learning Center started as a one-on-one tutoring program, opening its doors to low-income, undereducated, marginalized women in the Bridgeport community. Since then, the center has educated and empowered more than 10,000 women and their children. In the last five years, student enrollment at the center has increased by 40%. From July 1, 2014 – June 30, 2015, MLC served 1,050 women and children—more than any previous year. Students have come from 50 different countries of origin, and represent a wide range of races and ethnicities as well as ages. Nearly two-thirds of students are 25-44 years old, and 95% are mothers or primary caregivers of children 18 years old and younger. 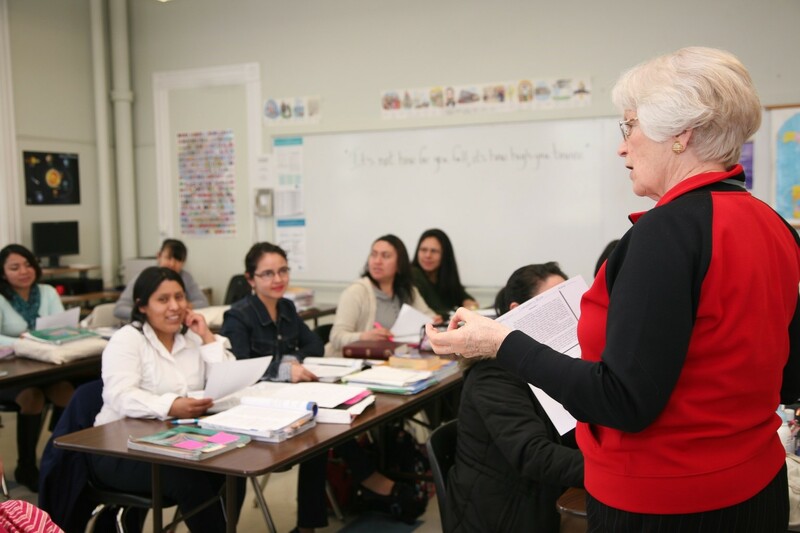 Many women who enter Mercy Learning Center with little or no English language ability are leaving, having earned a high school diploma (or equivalent) and able to find a job with a living wage. Never mind being able to explain their health symptoms clearly to a doctor, count change at a grocery store or stand up for themselves or their children. Talk about making a difference!